All Älymystö songs are licensed under the Creative Commons Attribution-Noncommercial-No Derivative Works 3.0 Unported License. This means you are free to redistribute the songs as you wish, but commercial use or remixing requires permission from us. If you’d like to include our songs on commercial compilations or would like to remix them, feel free to contact us on Facebook or by email (alymysto squiggly alymysto point com). A collection of previously unreleased songs and rarities from the Älymystö’s 10+ year long journey into the end-times of music. 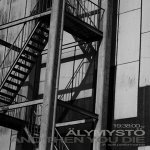 The Finnish electro/industrial units Älymystö & And Then You Die (aka ATYD) released a new Split EP titled 19:38:00. The digital download came out on December 24th 2009. Conceptually we began recording the first full length album as an ambient record. Along the way things went off course and into seemingly random directions. We diligently followed the songs around and in the end they came to range from the deep drones of field recorded insects in “Periplaneta A.” to the abstract improvisation of “Ikkunan takana” to the trip-hop of “Antiaine” to the brutal noise of “Ihmisennahkaa”. The structure was a reversal of the usual progression from easy to difficult material. On this limited edition EP our sound shifted slightly into a more atmospheric direction. Conversely the titular song was a step towards even danceable grooves. The first release, still a bit rough around the edges. This demo includes the original version of “Kilpisjärven talvi”, which is still — for many — the quintessential Älymystö song. 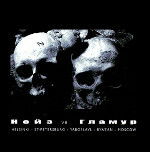 RTSI is the first project and initiative in Sweden to work against the discrimination of subculture/alternative people. The project is a 3-year initiative and is funded by Swedish Arv sfonden and run by Kulturens and KF Kretsen in cooperation with among others SUB – the national organisation for subcultures in Sweden. The USB ”Till alla er..” part 1 was released 21st of May 2016. Noise vs. Glamour ’06 was released 14th of Oct 2006 to celebrate the Noise vs. Glamour 2006 festival.